Since production started on Thor: Ragnarok the cast and crew have made one thing abundantly clear: they're having, like, the best time EVER. Chris Hemsworth, Tom Hiddleston, Mark Ruffalo, and director Taika Waititi have posted a bunch of amusing social media vids and pics over the months, and now? Well, it's all come to an end. 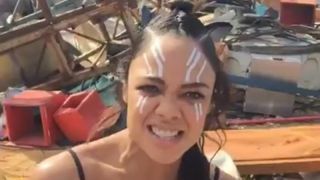 There's some nifty shots of movie set wreckage, that Waititi refers to as a "sci-fi space wasteland." It looks suspiciously like a trashed spacecraft, made even cooler by the extras in their grubby get up jumping around it. The whole cast and crew look like the happiest people on the planet. Directed by Taika Waititi and starring Chris Hemsworth, Tom Hiddleston, Jaimie Alexander, Tessa Thompson, Jeff Goldblum, Cate Blanchett, Karl Urban, and Mark Ruffalo, Thor: Ragnarok will be released in UK cinemas on October 27, 2017 before opening in US theatres on November 3, 2017.